SEVERAL local organisations have teamed up to offer a program of school holiday activities next week. 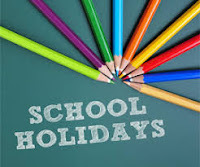 This year's Term 1 holiday period will coincide with coincide with the Easter break. All activities are free of charge, at no costs to families, but bookings are essential due to limits in some activities. To book, phone Steve on 0438 090 433. Anyone who makes a booking but later finds they are unable to attend should please call again to cancel and allow others to have to opportunity to fill the vacancy. Freedom Fitness 2/99 Ring Rd, New Norfolk. Meanwhile, an Adventure Patch Pop Up Playground will be at the Ellendale Hall, Ellendale, from 11am until 1pm on Wednesday, April 17. This activity is also free of charge, including lunch, sunscreen and drinking water, and coffee for the adults. Bookings are essential for the Pop Up Playground. Please contact Jo East by emailing jo.east@aus.salvationarmy.org or calling 6228 8419 to provide details of the age and number of children attending, and any dietary requirements. Bookings close on April 12. The Pop Up Playground is an initiative of Playgroup Tasmania, Children's University Tasmania, the Salvation Army Communities for Children program, and Adventure Patch. In the second week of the holidays, a video-making experience for Children’s University Students will be held in New Norfolk. Spokesman Matt Hill said the plan was to produce a number of one-minute videos for screening at the 2019 Childaware Conference in Brisbane in May. "The video must respond to the following question: 'What I/we need right now to be the best person I/we can be in the future'," Mr Hill said. "Participants are expected to have done some thinking on this topic prior to the workshop and are asked to bring any props etc that could be used on the day. Lunch will be provided." Presented by the Children's University Tasmania, the Salvation Army Communities for Children program and the Derwent Valley Youth Future Action Team (D'FAT), the video-making day will is free of charge and will be held on April 26 at the the Salvation Army Centre,79 Hamilton Rd, New Norfolk. Register online here.